In this video-article we present a method for isolating single or multiple Drosophila da neurons from third instar larvae using the infrared capture (IR) class of Laser Capture Microdissection (LCM). RNA obtained from the isolated neurons can be readily used for downstream applications including qRT-PCR or microarray analyses. Iyer, E. P., Cox, D. N. Laser Capture Microdissection of Drosophila Peripheral Neurons. J. Vis. Exp. (39), e2016, doi:10.3791/2016 (2010). The dendritic arborization (da) neurons of the Drosophila peripheral nervous system (PNS) provide an excellent model system in which to investigate the molecular mechanisms underlying class-specific dendrite morphogenesis1,2. To facilitate molecular analyses of class-specific da neuron development, it is vital to obtain these cells in a pure population. Although a range of different cell, and tissue-specific RNA isolation techniques exist for Drosophila cells, including magnetic bead based cell purification3,4, Fluorescent Activated Cell Sorting (FACS)5-8, and RNA binding protein based strategies9, none of these methods can be readily utilized for isolating single or multiple class-specific Drosophila da neurons with a high degree of spatial precision. Laser Capture Microdissection (LCM) has emerged as an extremely powerful tool that can be used to isolate specific cell types from tissue sections with a high degree of spatial resolution and accuracy. RNA obtained from isolated cells can then be used for analyses including qRT-PCR and microarray expression profiling within a given cell type10-16. To date, LCM has not been widely applied in the analysis of Drosophila tissues and cells17,18, including da neurons at the third instar larval stage of development. Here we present our optimized protocol for isolation of Drosophila da neurons using the infrared (IR) class of LCM. This method allows for the capture of single, class-specific or multiple da neurons with high specificity and spatial resolution. Age-matched third instar larvae expressing a UAS-mCD8::GFP19 transgene under the control of either the class IV da neuron specific ppk-GAL420 driver or the pan-da neuron specific 21-7-GAL421 driver were used for these experiments. RNA obtained from the isolated da neurons is of very high quality and can be directly used for downstream applications, including qRT-PCR or microarray analyses. Furthermore, this LCM protocol can be readily adapted to capture other Drosophila cell types a various stages of development dependent upon the cell type specific, GAL4-driven expression pattern of GFP. Allow from 6 hours, up to a week or longer for LCM depending upon the tissue type and the number of cells required. All the procedures are carried out in strictly RNAse-free conditions following standard procedures. Larvae expressing either 21-7-GAL4,UAS-mCD8::GFP or ppk-GAL4,UAS-mCD8::GFP transgenic reporter lines were used for these experiments. Collect 30-40 age-matched third instar larvae and wash them in ddH2O followed by brief rinses in RNAse Away (Sigma-Aldrich), and a final wash in ddH2O to remove RNAse Away. Wick off the excess ddH2O completely with a clean Kimwipe prior to embedding the larvae in OCT.
Take a clean tissue embedding mold and layer it with a thin (1.5-2mm) layer of OCT, just enough to cover a single layer of larvae. Prior to embedding the larvae, if needed, cool the OCT to 0°C in the tissue embedding molds. Do this by placing the mold containing OCT on a block of ice. This will help reduce larval movement during the embedding process. Place the clean larvae on the pre-cooled OCT and arrange them in parallel to one another. Once the larvae have been arranged, slowly fill the mold with OCT without disturbing the larval arrangement. Snap freeze the mold by placing it on a dry ice block. [Critical Step: Snap-freeze the larvae instantly to reduce movement.] This method will allow the larvae to be in a single plane, maximizing the number of cells available per section for capture. If it is necessary to preserve the tissue morphology for identifying the cells of interest, or if the expected number of cells per section is found to be satisfactory then proceed directly to Step 11. Wash 50-70 third instar larvae as described in Step 1. Place the larvae in a 1.5 ml microfuge tube containing 500 μl of RNAse free 1X PBS. Dounce the larvae using a polypropylene pestle (USA Scientific), with 6-7 slow powerful strokes. Centrifuge the solution at 16,000 (x) g for 5-10 seconds (until the larval cuticles settle down to the bottom of the microfuge tube]. Discard the supernatant. The pellet should primarily consist of larval cuticle to which the PNS, including da neurons, is tightly adhered. Wash the cuticle pellet 2-3 times in 1X PBS and resuspend the pellet in 500 μl 1X PBS. Spin the solution at 16,000 (x) g for 1 minute to form a compact pellet. Aspirate the supernatant completely using a fine Pasteur pipette. Carefully remove the pellet from the microfuge tube using a clean spatula, and wick off the excess PBS using a clean Kimwipe tissue. [Note: It is important to keep the pellet as compact as possible to increase the cell yield]. Place the compact cuticle pellet on a plastic mold containing a thin layer of OCT (1mm approx). Gently spread out the pellet in a thin circular area. Fill the mold with OCT, and freeze the tissue as described in Step 4. Store the slides either directly on dry ice or at -80°C in a clean slide-box until ready for microdissection. Perform LCM preferably within a week after sectioning the tissue. Remove the slides containing the frozen larval tissue sections from the -80°C freezer and place them on dry ice. Remove a single slide from dry ice and immediately place it directly into a 50 ml conical tube filled with 70% ethanol fixative, followed by a short rinse in RNAse free ddH2O according to the recommended times presented in Table 1. The presence of larval cuticle in the frozen sections may impair the capture efficiency by preventing efficient LCM cap-cell contact which may lead to non-specific capture. If necessary, conduct the following steps (4-5) to clear the cuticle from tissue sections. Rinse the sections briefly in a 50 ml conical tube containing RNAse-free ddH2O to remove trypsin, and loosely adhered cuticle fragments. Dip the slides sequentially in each of the remaining ethanol and xylene solutions for the recommended times (Table 1) to complete the dehydration process. Following the dehydration gradient, the slides are briefly dried under a mild air stream for 60-120 seconds at room temperature prior to performing LCM. [Caution: Dry the xylene completely from the tissue sections prior to performing LCM. Xylene is known to dissolve the LCM cap polymer resulting in microdissection failure]. Table 1: Recommended procedure for LCM dehydration of frozen larval tissue sections. PixCell IIe LCM instrument equipped with Fluor 300 epifluorescence optics optimized for EGFP was used for performing the LCM. Turn on the power for the microscope and laser control box. Load the CapSure cap holder assembly with HS LCM caps (Molecular Devices): Two cartridges of LCM caps may be loaded at one time. Open the Molecular Devices software and enter the experiment details including slide number and Cap lot number. Load a new HS LCM cap from the cartridge onto the PixCell IIe LCM instrument and position it correctly with respect to the joystick to ensure proper positioning of the cap in relation to the capture area. Place the microscope slide containing freshly dehydrated larval tissue sections on the microscope stage for microdissection. Locate the fluorescently labeled cells using the oculars or the computer screen. Due to the high specificity of ppk-GAL4,UAS-mCD8::GFP transgenic reporter line, the class IV da neurons can be easily identified by GFP fluorescence. Subject the tissue to LCM using CapSure HS LCM caps [for a detailed set of instructions for setting the instrument, focusing the laser and performing LCM see reference22]. Once all the cells of interest have been captured, lift the HS LCM cap with the microdissected cells and placed it on a clean slide to confirm the presence of the captured cells and visually inspect the cap for presence of unwanted cells or debris. Attach the cap containing the microdissected cells to an ExtracSure (Molecular Devices) device. Add 12μl of RNA extraction buffer (PicoPure, Molecular Devices) to the cap surface containing the cells and connect an inverted thin-walled reaction tube (GeneAmp, Applied Biosystems) to the ExtracSure device. Place the assembly on an alignment tray (Molecular Devices) and cover it with an incubation block (Molecular Devices) pre-heated to 42°C inside an incubator. Following a 30 minute incubation, centrifuge the tubes containing the extracts at 800 (x) g for 2 minutes. Close the tubes and store the cell extracts at -80°C until ready for RNA purification. Extract and column purify the RNA according to the PicoPure (Molecular Devices) RNA extraction kit instructions. DNAse treatment is optional, and can be performed on column during the RNA purification as necessary. If required, multiple LCM samples can be pooled together during purification in a single column to increase the final RNA yield and can be eluted in a small volume (11-30 μl) of elution buffer (PicoPure, Molecular Devices) and stored at -80°C until ready for use. If desired a 1 μl aliquot may be used to assess total RNA quality on a Bioanalyzer 2100 (Agilent Technologies, Inc.). Laser capture microdissection (LCM) was used to isolate single, class-specific or multiple Drosophila da neurons from third instar larvae (Figure 1). LCM allows for a high degree of precision and specificity in the isolation of Drosophila da neuron cell bodies (Figure 2a-c). Moreover, the total RNA purified from these isolated da neurons was found to be of excellent quality as indicated by the presence of sharp 5.8S, 18S and 28S ribosomal RNA peaks when analyzed on an Agilent 2100 Bioanalyzer (Agilent Technologies, Inc.) (Figure 2d). To assess the neuronal-specific enrichment of our isolated cells we performed real-time quantitative reverse transcription PCR (qRT-PCR) using the neuronal gene-specific marker, elav. For the qRT-PCR analyses, we calculated the relative levels of elav expression in the LCM microdissected da neurons and normalized this expression to that of our endogenous control (rp49) and relative to total RNA isolated from whole larvae using the ΔΔCt method23. 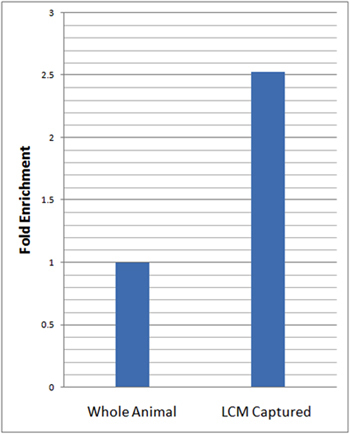 These analyses revealed over 2.5 fold enrichment in the relative levels of elav in LCM micro-dissected da neuron samples as compared to whole animals (Figure 3). Figure 1: LCM of Drosophila peripheral neurons. (a) Age matched third instar larvae are selected, washed and (b) embedded in a cryomold with OCT and frozen at -80°C, (c) 8μm serial tissue sections are created using a standard cryostat and (d) placed uniformly on clean glass slides. The glass slides with the affixed tissue sections are stored at -80°C prior to LCM processing. (e,f) Immediately preceding LCM, the tissue sections are thawed and briefly fixed in 70% ethanol followed by brief rinse in ddH2O. (g) The slides are briefly incubated with trypsin and rinsed with ddH2O to remove cuticles (black) from the larval sections. (h,i) tissue sections without larval cuticle are then further dehydrated in an ethanol gradient and finally cleared in xylene. (j) The LCM cap with a thermolabile polymer is placed on the tissue section and the laser is pulsed on the selected fluorescent cell body. The laser pulse melts the polymer and engulfs the selected cell body. The polymer cap, along with the captured cell body is lifted, and (k) RNA extraction buffer is added to the cell. The captured cell, along with the RNA extraction buffer is incubated at 42°C for 30 minutes and can be either stored at -80°C, or directly processed for RNA purification. Figure 2: LCM facilitates high precision capture of da neurons. (a) Representative image of a dehydrated and trypsin treated 8 micron tissue section prior to performing LCM, showing two class-IV da neurons labeled with GFP by the ppk-GAL4,UASmCD8::GFP reporter strain. Note, one of the neurons is highlighted (arrowhead) for capture. (b) Cell body of the highlighted neuron (arrowhead) is cleanly micro-dissected with high specificity from the tissue section. (c) End-on view of a single class-IV da neuron captured on the LCM cap. (d) Agilent 2100 Bioanalyzer (Agilent Technologies, Inc.) electropherogram of total RNA isolated from LCM-derived da neurons, showing excellent RNA quality as indicated by the presence of sharp 5.8S, 18S, and 28S rRNA peaks. Figure 3: qRT-PCR reveals substantial enrichment of neuronal marker gene expression in LCM captured da neurons relative to whole animal. qRT-PCR analyses of neuron-specific marker gene expression (elav) in LCM captured da neurons (21-7-GAL4,UAS-mCD8::GFP) and whole animals in age matched third instar larvae was performed in triplicate. Relative levels of elav expression in LCM captured da neurons were normalized to the endogenous control (rp49) and relative to whole larvae using the ΔΔCt method23. A 2.5 fold enrichment in the relative levels of elav in LCM captured da neuron samples was observed relative to whole animals. Problem: RNA degraded, or of low quality. Ensure RNAse free condition throughout experiment. Try reducing amount of time spent on LCM per slide to 30 minutes. Keep the slides and samples on dry ice except when performing LCM. Avoid thawing the tissue sections once they are cut. Problem: Most cells are lost from the slide during trypsin treatment (step 17-18). Try reducing the time of trypsin treatment. Try reducing the trypsin concentration. Problem: Presence of cuticle and other non-specific tissue debris on the cap polymer. Try removing the tissue debris by blotting the polymer surface with the tacky side of an adhesive note22. Try increasing the incubation time in 100% ethanol and xylenes. Reduce room humidity using dehumidifiers. The protocol presented herein describes our optimized method for the isolation of Drosophila peripheral neurons via LCM. While this LCM protocol was designed for the specific isolation of single, class-specific or multiple Drosophila da neurons from the third instar larval stage of development, minor modifications of the protocol could readily be adapted for the capture of other Drosophila cell types from all developmental stages using distinct GAL4,UAS-mCD8-GFP reporter transgenes which label the cell type or types of interest. Our results demonstrate that the RNA obtained from laser capture micro-dissected da neurons is of very high quality allowing for potential direct use in qRT-PCR or microarray-based analyses. Applications of this protocol extend beyond the capture of wild-type cells of interest, as discussed here, where LCM could be used in combination with loss-of-function (UAS-RNAi) and/or gain-of-function studies employing the GAL4/UAS system in a cell type of interest. We thank Drs. Yuh-Nung Jan and Wes Grueber for providing fly stocks used in this study, and Virginia Espina, Dr. Emanuel Petricoin and Dr. Lance Liotta for assistance with LCM. The authors acknowledge the Thomas F. and Kate Miller Jeffress Memorial Trust for support of this research (D.N.C.) and the George Mason University Provost s Office (E.P.R.I.). Corty, M. M., Matthews, B. J., Grueber, W. B. Molecules and mechanisms of dendrite development in Drosophila. Development. 136, 1049-1061 (2009). Parrish, J. Z., Emoto, K., Kim,, Jan, Y. N. Mechanisms that regulate establishment, maintenance, and remodeling of dendritic fields. Annu. Rev. Neurosci. 30, 399-423 (2007). Wang, X., Starz-Gaiano, M., Bridges, T., Montell, D. Purification of specific cell populations from Drosophila tissues by magnetic bead sorting, for use in gene expression profiling. Nature Protocols. (2008). Iyer, E. P. R., Iyer, S. C., Sulkowski, M. J., Cox, D. N. Isolation and purification of Drosophila peripheral neurons by magnetic bead sorting. J Vis Exp. 34, 2912-2917 (2004). Tirouvanziam, R., Davidson, C. J., Lipsick, J. S., Herzenberg, L. A., Tirouvanziam, R., Tirouvanziam, R. Fluorescence-activated cell sorting (FACS) of Drosophila hemocytes reveals important functional similarities to mammalian leukocytes. Proc. Natl. Acad. Sci. 101, 2912-2917 (2004). Shigenobu, S., Arita, K., Kitadate, Y., Noda, C., Kobayashi, S. Isolation of germline cells from Drosophila embryos by flow cytometry. Dev. Growth Differ. 48, 49-57 (2006). Reeves, N., Posakony, J. W. Genetic programs activated by proneural proteins in the developing Drosophila PNS. Dev. Cell. 8, 413-425 (2005). Jinushi-Nakao, S. Knot/Collier and Cut control different aspects of dendrite cytoskeleton and synergize to define final arbor shape. Neuron. 56, 963-978 (2007). Yang, Z., Edenberg, H. J., Davis, R. L. Isolation of mRNA from specific tissues of Drosophila by mRNA tagging. Nucl. Acids Res. 33, (2005). Appay, V. Sensitive Gene Expression Profiling of Human T Cell Subsets Reveals Parallel Post-Thymic Differentiation for CD4+ and CD8+ Lineages. J. Immunol. 179, 7406-7414 (2007). Ginzinger, D. G. Gene quantification using real-time quantitative PCR: An emerging technology hits the mainstream. Exp. Hematol. 30, 503-512 (2002). 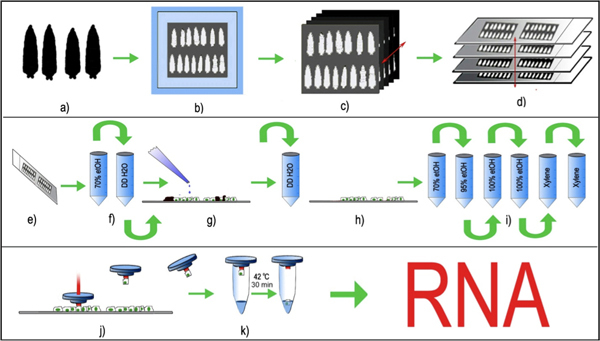 Keays, K. M., Owens, G. P., Ritchie, A. M., Gilden, D. H., Burgoon, M. P. Laser capture microdissection and single-cell RT-PCR without RNA purification. J. Immunol. Methods. 302, 90-98 (2005). Volgin, D. V., Swan, J., Kubin, L. Single-cell RT-PCR gene expression profiling of acutely dissociated and immunocytochemically identified central neurons. J. Neurosci. Methods. 136, 229-236 (2004). Emmert-Buck, M. R. Laser capture microdissection. Science. 274, 998-1001 (1996). Xiao, W. Gene expression profiling in embryonic mouse lenses. Mol. Vis. 12, 1692-1698 (2006). 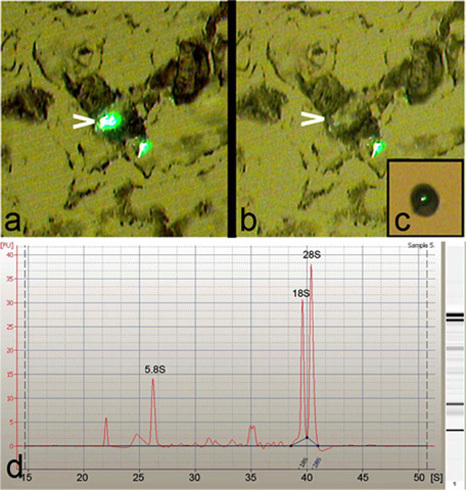 Scharschmidt, T. Analysis of human osteoarthritic connective tissue by laser capture microdissection and QRT-PCR. Connect. Tissue Res. 48, 316-323 (2007). Spletter, M. L. regulates Drosophila olfactory projection neuron identity and targeting specificity. Neural Dev. 2, 14-14 (2007). Hoopfer, E. D., Penton, A., Watts, R. J., Luo, L. Genomic analysis of Drosophila neuronal remodeling: a role for the RNA-binding protein Boule as a negative regulator of axon pruning. J. Neurosci. 28, 6092-6103 (2008). Grueber, W. B. Projections of Drosophila multidendritic neurons in the central nervous system: links with peripheral dendrite morphology. Development. 134, 55-64 (2007). Song, W., Onishi, M., Jan, L. Y., Jan, Y. N. Peripheral multidendritic sensory neurons are necessary for rhythmic locomotion behavior in Drosophila larvae. Proc. Natl. Acad. Sci. USA. 104, 5199-5204 (2007). Espina, V. Laser capture microdissection. Nat. Prot. 1, 586-603 (2006). Livak, K. J., Schmittgen, T. D. Analysis of relative gene expression data using real-time quantitative PCR and the 2(-Delta Delta C(T)) method. Methods. 25, 402-408 (2001). We recently found an Arcturus Pix Cell II LCM in an abandoned lab and are interested in getting it up and running. Is there someone that services these devices? Is the company still around? There is not much current info posted. Thanks! Dear Claudia...the Arcturus line of LCM products has been acquired from Molecular Devices by Applied Biosystems. Information is available at www.appliedbiosystems.com/absite/us/en/home/news-announcements/arcturus-lcm-instruments-consumables.htm. I would recommend contacting Applied Biosystems for recommendations on service to the PixCell II LCM system. Good luck!